New Caledonia, or Nouvelle-Calédonie, is an overseas territory of France. British explorer James Cook named the territory’s main island “New Caledonia” because the island's purple hills reminded him of the the Scottish Highlands. New Caledonia's capital, Nouméa, is the seat of the Secretariat of the Pacific Community, formed by Australia, France, the Netherlands, New Zealand, the United Kingdom, and the United States in 1947 to promote economic and social stability in the countries of the South Pacific. The unresolved issues of independence from France and resurgent Kanak nationalism have underpinned the affairs of the territory since 1985, causing protest and bloodshed. Located in Melanesia in the southwest Pacific Ocean, approximately 745 miles (1,200 kilometers) east of Australia and 4,900 miles (1,500 kilometers) northwest of New Zealand, New Caledonia is made up of a main island, the “Grande Terre,” and several smaller islands, the Belep archipelago to the north of Grande Terre, the Loyalty Islands to the east, Île des Pins to the south, and the Chesterfield Islands and Bellona Reefs further to the west. 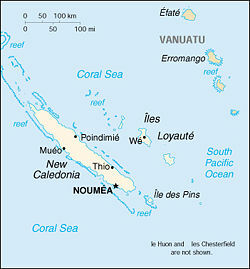 Vanuatu lies to the northeast. At about half the size of Taiwan, it has a land area of 7,172 square miles (18,575 square kilometers). Grande Terre, by far the largest island, has an area of 6,320 square miles (16,372 square kilometers), and is elongated northwest-southeast, about 220 miles (350 kilometers) in length and 30 to 45 miles (50 to 70 kilometers) wide. A mountain range runs the length of the island, with five peaks over 4,900 feet (1,500 meters). The highest point is Mont Panié at 5,340 feet (1,628 meters). The capital is Nouméa, the only major urban area in the territory, situated on a peninsula in the south of Grande Terre. New Caledonia lies astride the Tropic of Capricorn, between 19 degrees and 23 degrees south latitude. The climate is tropical and rainfall is highly seasonal, brought by trade winds that usually come from the east. 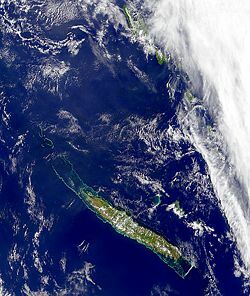 Rainfall averages about 59 inches (1,500 millimeters) yearly on the Loyalty Islands, 79 inches (2,000 millimeters) at low elevations on eastern Grande Terre, and 79 to 158 inches (2000 to 4000 millimeters) at high elevations on Grande Terre. The western side of Grande Terre lies in the rain shadow of the central mountains, and rainfall averages 47 inches (1,200 millimeters) a year. Unlike many Pacific islands that are of relatively recent volcanic origin, New Caledonia is an ancient fragment of the Gondwana super-continent. New Caledonia and New Zealand separated from Australia 85 million years ago and from one another 55 million years ago. As a result, New Caledonia still carries many unique indigenous plants and animals of Gondwanan origin. The best known is a hen-sized bird, the kagu, which cannot fly, has a large crest, and a peculiar cooing song, that, along with its image, serves as a national emblem. The Niaouli tree, an ancient remnant that also grows in Australia and New Guinea, is of medical interest, as its sap yields gomenol, which smells like camphor and is used to treat head colds. Before the Europeans arrived, there were no indigenous mammals other than the Roussette (flying fox)—a large vegetarian bat—also a local delicacy. The islands make up two terrestrial eco-regions, the New Caledonia rain forests on the Loyalty Islands, Île des Pins, and the eastern side of Grand Terre, and the New Caledonia dry forests in the rain shadow on the western side of Grand Terre. As the Europeans settled on the dry west coast and left the east to the Kanaks, the political division followed the natural one. New Caledonia's freshwater ecology also evolved in long isolation, and the New Caledonia rivers and streams are home to many indigenous species. The New Caledonia Barrier Reef, which surrounds Grande Terre and Île des Pins, is the second-largest coral reef in the world after Australia's Great Barrier Reef, reaching a length of 930 miles (1,500 kilometers). The reef has great species diversity, is home to endangered dugongs, and is an important nesting site for green sea turtles (Chelonia mydas). The western Pacific was first populated about 50,000 years ago. The Austronesians moved into the area later. The diverse group of people that settled over the Melanesian archipelagos are known as the Lapita. They arrived in the archipelago now commonly known as New Caledonia and the Loyalty Islands around 1500 B.C.E. The Lapita were highly skilled navigators and agriculturists with influence over a large area of the Pacific. From about the eleventh century, Polynesians also arrived and mixed with the populations of the archipelago. The British explorer James Cook sighted Grande Terre in 1774 and named it “New Caledonia” after the Scottish Highlands, because the purple hills and mountainside looked as if they were covered in heather. "Caledonia" was a popular poetic and patriotic term for Scotland, and James Cook's father was Scots. British and North American whalers and sandalwood traders became interested in New Caledonia. Europeans used liquor and tobacco among other things to barter for commodities. Contact with Europeans brought new diseases such as smallpox, measles, dysentery, influenza, syphilis, and leprosy; many people died as a result. Tensions developed into hostilities and in 1849 the crew of the "Cutter" were killed and eaten by the Pouma clan. As trade in sandalwood declined, it was replaced by a new form of trade, “blackbirding.” This involved enslaving people from New Caledonia, the Loyalty Islands, Vanuatu, Papua New Guinea, and the Solomon Islands to work on sugar cane plantations in Fiji and Queensland, Australia. The slave trade was ended at the start of the twentieth century. Catholic and Protestant missionaries first arrived in the nineteenth century. They insisted people should wear clothes to cover themselves and eradicated many local practices and traditions. The island was made a French possession in 1853 in an attempt by Napoleon III to rival the British colonies in Australia and New Zealand. Following the example set by the British in nearby Australia, France sent a total of 22,000 convicted felons to penal colonies along the southwest coast of the island between 1854 and 1922. These convicts included regular criminals as well as political prisoners such as Parisian socialists and Kabyle (Algerian Berber) nationalists. Towards the end of the penal colony era, free European settlers (including former convicts) and Asian contract workers out-numbered the population of forced workers. The indigenous Kanak populations declined drastically in that same period due to introduced diseases and an apartheid-like system called "Code de l'Indigénat" which imposed restrictions on their livelihood, freedom of movement, and land ownership. Before colonization by the French, linguistic and territorial divisions separated Melanesian groups. Social and racial discrimination practiced by whites commingled all Pacific blacks, and then only those from New Caledonia, under the term “Kanak." The name "Kanaky" is favored by Melanesian nationalists. The word comes from “kanaka,” a Polynesian word meaning “human.” The French later used the word to describe all the native inhabitants of the South Pacific Ocean. The word, turned into “Canaque” in French, became derogative. When Melanesian inhabitants started to form political parties, this derogative word became a symbol of political emancipation and pride. Agitation by the Front de Libération Nationale Kanak Socialiste (FLNKS) for independence began in 1985. New Caledonia has been on a United Nations list of non-self-governing territories since 1986. The FLNKS (led by the late Jean-Marie Tjibaou, assassinated in 1989) advocated the creation of an independent state of “Kanaky.” The troubles culminated in 1988 with a bloody hostage taking in Ouvéa. The unrest led to an agreement on increased autonomy in the Matignon Accords of 1988 and the Nouméa Accord of 1998. This accord describes the devolution process as "irreversible" and provides for a local Caledonian citizenship, separate official symbols of Caledonian identity (such as a "national" flag), and mandates a referendum on independence from the French Republic sometime after 2014. Along with French Polynesia and Wallis and Futuna, New Caledonia is part of the French Republic, but is unique in that its status is in between that of an independent country and an overseas territory of France. New Caledonia was a French colony until 1946, and an overseas territory from 1946 to 1999. Administratively, the archipelago is divided into three provinces: the Loyalty Islands, the northern mainland, and the southern mainland. It is further subdivided into 33 communes. Eight “traditional spheres” exist to administer Kanak tribal affairs. Their jurisdiction does not encompass non-Kanaks living within these zones. These traditional spheres roughly correspond to indigenous language areas and areas of pre-French tribal alliances. A territorial congress and a government have been established. Under the 1998 Nouméa Accord, taxation, labor law, health and hygiene, and foreign trade are already in the hands of the territorial congress, with further responsibilities likely. Eventually, the French Republic will retain control of foreign affairs, justice, defense, public order, and treasury. A New Caledonian “citizenship” has been introduced. Only New Caledonian “citizens" may vote in the local elections, a measure that has been criticized because it excludes recently arrived French citizens. New Caledonia may cooperate with independent countries of the Pacific Ocean and the territorial congress may pass statutes that differ from French law. Inhabitants of New Caledonia remain French citizens and carry French passports and take part in the legislative and presidential French elections. New Caledonia sends two representatives to the French National Assembly and one senator to the French Senate. The representative of the French central state in New Caledonia is the High Commissioner of the Republic, locally known as the haussaire, who is the head of civil services. According to the Nouméa Accord, the territorial congress will have the right to call for a referendum on independence after 2014. In 2006 the territorial congress elected Marie-Noëlle Thémereau as president. He is from the loyalist (anti-independence) Future Together party, which toppled the long-time ruling Rally for Caledonia inside the Republic (RPCR) in May 2004. Future Together comprises mostly Caucasian and Polynesian New Caledonians opposed to independence but tired of the RPCR. Future Together opposes race-based policies and favors a multicultural society. New Caledonia has about 25 percent of the world's known nickel resources, mostly mined from open-pit mines. Only a small amount of the land is suitable for cultivation, and food accounts for about 20 percent of imports. In addition to nickel, substantial financial support from France, equal to more than one-fourth of GDP, and tourism, are keys to the health of the economy. Substantial new investment in the nickel industry, combined with the recovery of global nickel prices in 2006, brightened the economic outlook. Exports totaled U.S. $999 million in 2004. Export commodities were ferro nickels, nickel ore, and fish. Export partners were Japan (18.4 percent), France (13.8 percent), Taiwan (12.8 percent), South Korea (12.6 percent), Spain (7.7 percent), China (6.3 percent), and Belgium (4.1 percent). Imports totaled U.S. $1.636 billion in 2004. Import commodities included machinery and equipment, fuels, chemicals, and foodstuffs. Import partners were France (40.1 percent), Singapore (17.8 percent), Australia (9.6 percent), and New Zealand (5.1 percent). Per capita GDP was U.S. $15,000 in 2003. The population of New Caledonia at the 2004 census was 230,789 inhabitants. The rest of the population is made up of ethnic groups that arrived in the past 150 years. Europeans make up 34.5 percent (the majority are French with German, British, and Italian minorities), Polynesians (Wallisians and Tahitians), 11.8 percent; Indonesians, 2.6 percent; Vietnamese, 1.4 percent; Ni-Vanuatu, 1.2 percent; and various other groups. Whites (people of European extraction) who have lived in New Caledonia for several generations are locally known as Caldoches, whereas newcomers who have emigrated from metropolitan France are called Métros or Métropolitains. Official statistics do not distinguish between Caledonian-born whites and French-born whites, however it is estimated that approximately two-thirds identify themselves with the Caldoche community. There is a significant contingent of people who arrive from France to work for a year or two and others who have come to retire. Caldoche culture has similarities with Australian and Afrikaaner culture. Until recently the Kanak population was economically disadvantaged. The pro-independence movement has alleged that the French government attempted to skew the demographic balance by clandestinely settling thousands of people from mainland France. The census in August and September 2004 was carried out amid this controversy. French president Jacques Chirac had questions on ethnicity deleted from that census, on grounds that such questions contravened the French Constitution. The indigenous Melanesian Kanak leaders called for New Caledonians of Kanak ethnicity not to return census forms if questions regarding ethnicity were not asked, threatening to derail the census process. Eventually, the statistics office agreed to ask questions regarding ethnicity, but no data was released, leaving the ethnic tables from the 1996 census as the only information on ethnicity available. The census total from September 2004, 230,789 inhabitants meant a less-than-expected annual population increase of 1.9 percent since 1996. A large influx of white people from metropolitan France feared by Kanak leaders did not happen. French is the official language, while an estimated 27 Kanak languages, belonging to the Oceanic sub-branch of Austronesian languages, coexist. New Caledonia is a Christian territory. Sixty percent identify themselves as Roman Catholic, 30 percent Protestant, and 10 percent follow other religions. Kanaks maintain a belief in an immanent ancestral presence under diverse forms (animals, plants, minerals, and atmospheric phenomena). There is no priestly caste, but each lineage has a guardian of the magic that protects the clan. Rites that invoke ancestors are domestic and individual, according to ethnologist Alban Bensa. There are no collective religious rituals. Sacred places, old dwelling sites, and cemeteries exist, but propitiatory rites are personal. Kanaks believe the land of the dead is under water. It receives the souls of those who have had funeral ceremonies that continue for one year after death. Through those ceremonies, one becomes an ancestor. Traditional Kanak society is organised around clans, comprising several families related through a common ancestor, and numbering between 50 and several hundred people. Within the clan there is a hierarchy between the members of the clan and between the families, then within the descendants. The clan's chief is called the “eldest brother” who presides over clan life and settles any disputes. In the Loyalty Islands, clans have integrated into a “customary district," a more elaborate organization centering on a large chefferie, or dwelling place ruled by the chief. The chief’s status and prestige is similar to Polynesian royalty. The clan's chief owes obedience and respect to the great chief, who is the final arbiter in any dispute. Kanak society distinguishes the responsibilities of men and women. Men are responsible for the community's food resources, public life, entering into alliances, and the clan's social relations. Women are responsible for the home, for the family's supplies, and for raising the children to become members of the clan. After adolescence, boys live together in a separate area where they are educated on their future social and clan responsibilities; they work for the community and are cared for by it. The girls remain with their mothers at the family home where they learn the rudiments of family and domestic life; they leave their homes when they marry. The Kanak have distinct attitudes and gestures depending on whether one is addressing a brother, an uncle, a brother-in-law, or an aunt. Favors are bestowed according to age. At meals, the old men and women are served first. The education system achieves 91 percent literacy and consists of primary and secondary schools, and the University of New Caledonia in Nouméa. The most widely known New Caledonian art forms are found on chiefly houses: high, conical dwellings that featured striking door frames with massive, broad faces and patterns structured around zigzags and diamonds. More stylized carvings, representing clan ancestors, are found on spires emerging from the tip of the roof. Other art forms include fine greenstone ceremonial adzes, composed of a large flat disc, mounted on a staff with tapa, fiber, and fur. These were carried by chiefs, and used by priests in ceremonial invocations. Engraved bamboos, featuring geometric motifs and images of fish, boats, and guns, depict interactions between Europeans and Kanaks. New Caledonia boasts a folk music heritage in the Melanesian tradition. The Pacific Tempo is an important music festival, held every three years in Noumea; the biennial Équinoxe is also an important celebration. Modern popular performers include OK! Ryos, Edou and Gurejele, who are at the forefront of the popular Kaneka movement. Kaneka fuses traditional styles with pop music and world music. The most well-known modern record label on New Caledonia is Alain Lecante's Mangrove Studios, which distributes much of the Kaneka music. Traditional instruments include bamboo flutes and conch shells. The Kanaks have developed dance into an art form. The traditional pilou dance tells the stories of births, marriages, cyclones, or preparations for battle. Colonial authorities banned pilous in 1951 for the high-energy and trance-like state they induced in the dancers, and for the resultant occasional eating of human flesh. Oral literature consists of poetry, epics, tales, myths, and historical accounts. There have been several publications of these documents, but the majority of texts collected in vernacular languages are unpublished. A written modern Kanak literature has emerged. ↑ 1.0 1.1 LeMonde.fr avec AFP, La Nouvelle-Calédonie se dote d'un hymne et d'une devise LeMonde (18.08.10). Retrieved January 19, 2012. ↑ Central Intelligence Agency, New Caledonia The World Factbook. Retrieved January 19, 2012. ↑ INSEE-ISEE, Population des communes et provinces de la Nouvelle-Calédonie de 1956 à 2009 Retrieved January 19, 2012. ↑ 4.0 4.1 ISEE, Nouvelle Calédonie En bref 10 Retrieved January 19, 2012. ↑ Culture of New Caledonia. EveryCulture.com. Retrieved April 26, 2007. This page was last modified on 19 January 2012, at 16:37.